This observation backup camera system comes preconfigured with our 7-inch monitor which is perfect for the panoramic camera included with this system. It has 2 channels for those who want to add a second camera. The rear-view monitor has a very bright LCD panel which provides a perfect image even in direct sunlight, and with the special technology built in to the camera it knows to auto dim at night for a softer more comfortable view. The 7-inch monitor includes a dash mount that can be bolted or glues to your dash and some of our more creative customers have even hung the monitor from their ceiling. The RV Camper Box camera Has a 180° Degree viewable angle, its waterproof and has auto night vision. The wireless has optimal reception for up to 70ft this allows it to work perfectly without interruption in any vehicle. The camera is one of the most durable we have, with incredible adjustability and night vision clarity. 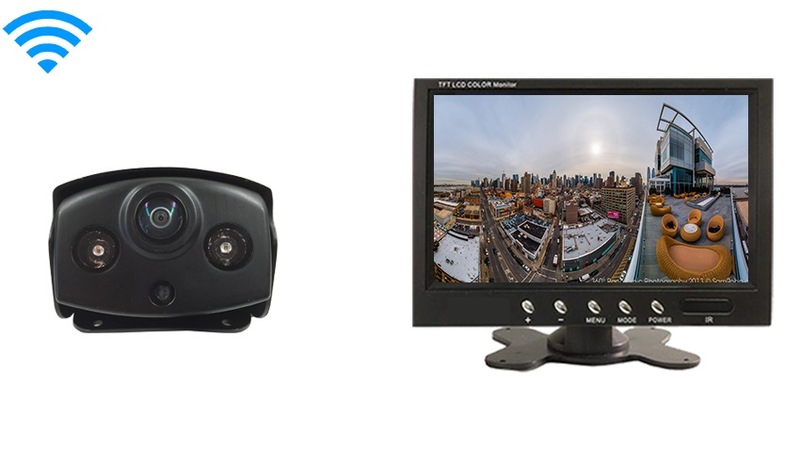 This panoramic camera can also function as an observation backup camera which means that when installing it, you can decide whether you want the camera to activate only when your parking/going in reverse or use it as an observation backup camera leaving it on continuously while you driving down the road. The camera is the WIDEST on the market. There is nothing wider and there is no possible way to get a wider more panoramic view. You will see absolutely anything and everything behind you and to the sides as extreme as possible. If you are looking for a wide view backup camera, look no further, you have found the best!. This panoramic RV system includes 1 set of our standard 70ft wireless transmitters. They were designed to work with any Campers, Trailers, or commercial tractor trailers in any environment, we have even tested them against microwaves and other wireless signals and they kept a solid signal. The transmitters are 100% water proof and are very easy to install. The basic idea of installation is that you connect the camera side to 12 volts then the monitor side to 12 volts, fire it up and you’re good to go. We also include a very easy to follow installation guide explaining how to install the backup camera system. For those who want a longer range or prefer the reliability and security of a digital signal we suggest you upgrade at the top right of the page to our higher range transmitters, if you have an aluminum trailer, we find that the digital upgrades always deliverers a better image. You can upgrade our transmitters to have a flawless digital range of up to 225ft. This observation system, like most of our vehicular products that have multiple inputs, can be used for video gaming, Considering that a perk or bonus for purchasing our back up system (others block that feature). Looking for a stronger signal?